Faceless figures in flowing ghutras and thobes stood defiantly, looking out at a vast, barren, and desolate landscape. Beyond them, nothing but sand. Nearby, camels are slumped in repose, shielding their heads from the unrelenting sun. On the distant horizon, a blurry outline of a city, shimmering in the updraft emanating from the dunes. Or was it just a mirage? Where were we? Not where you'd think. The scene I just described is depicted in a mural, painted on the walls of Sahara Falafel, a tiny restaurant in the Anaheim's Little Gaza District on Brookhurst Street. With Disneyland mere blocks away, we were in the heart of Orange County -- but as we waited for our orders of food to be prepared, we felt as if we had travelled to a distant place, far away from Stepford, and somewhere closer to the Sahara Desert itself. Also waiting was a young woman, dressed in a traditional black hijaab, who smiled as her three-year old son stared at me curiously with wide eyes. I waved to him, grinning. He giggled brightly, while at another table, a group of bookish young men chattered away in Arabic, chewing on skewered meat and scooping up hummus with rolled pieces of pita bread. Behind the counter, a gruff elderly man with a wind-weathered face fried small batches of falafel in a small teflon pot, slowly turning the balls in the hot oil with a slotted spoon. Next to him, an frail-looking old woman, also in a hijaab, tended a grill no bigger than a school desk, tenderly flipping kaftas, kabobs, and vegetables as they roasted over a lapping fire. Between them, rotating on a vertical spit, spun what was left of the shawarma. Since it was past nine-thirty at night, the slender cylinder of meat was shorn down almost to the metal rod, looking like a spent apple core. After a good fifteen minutes, our food was ready, served to us by the old woman. What she brought was the most gorgeous mound of food to grace a styrofoam plate I had ever seen. This was the BBQ Combination Plate ($10.95). 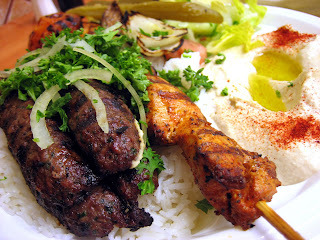 The largest well of the plate was occupied by a grilled tomato, onion, a grilled beef sausage called kafta and a skewer of seasoned white-meat chicken over fluffy rice, studded with bits of fresh parsley. On the side; a simple salad dressed with lemon juice and a serving of hummus, dimpled with two glistening puddles of olive oil. Also, almost unnoticed by us at first, was a thimble-sized plastic container of garlic paste called toum. Being fans of the acclaimed Zankou Chicken garlic paste, we hastily ripped off a ragged swatch of pita bread and dabbed it into the innocent-looking concoction. A split second after the white substance touched our tongues, a searing hit of unmitigated garlicness sucker-punched our throats and burned a path clear into our sinuses. We winced. "Pain. Oh the pain!," we cried as our eyes welled up with tears. It stung, but it stung good. If Zankou's garlic paste was acetic acid, this was downright hydrochloric. While the former toned down their version with boiled potato, it was evident Sahara Falafel did not. Instead, they utilized nothing but straight up raw garlic, salt, lemon juice, and olive oil. Untamed, undiluted, this was toum at its purest and most potent: a blissful dose of garlic heaven. Respecting its ferocious power, I used this edible napalm sparingly, slathering a narrow swath on the inner surface of my pita. Then I stuffed the pocket with kafta and chicken before I drug the open end through some hummus. As I bit into it, the kafta, spiced lightly with cloves and cinnamon, crumbled like a firm and dense ground-beef meatball. But the toum still managed to bite back. The Falafel Sandwich ($3.95), also utilized a smear of toum, but was balanced by flaked chili, tahini, lettuce and tomato. 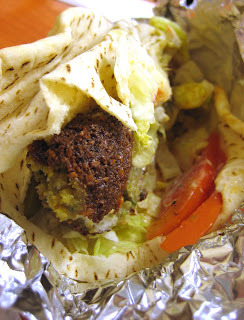 The wrap's main attraction was, of course, the falafel. The crunchy deep-fried orbs of well-spiced, mashed chickpea possessed a dark mahogany crust with the rough and tumble texture of gravel; pebbly and crackly. Hiding beneath was a potato-soft and ultra-savory center so rich in flavor, it easily substituted for meat. After polishing off the meal, the toum we consumed relented, following us home, staying with us through the night and the morning after. It lingered in our breaths and in our consciousness. Garlic heaven turned into a garlic demonic possession. There, in the thick haze of our stinky, smelly burps was the souvenir from our trip to Little Gaza. I can smell you from all the way over here. And you smell tasty! I love garlic. The stronger, the better. If I were ever stuck in the searing hot and parched sand dunes of the Arabian desert, I would choose to be with you rather than a cool canteen of ice water! You're even better than a camel! With every description, I can taste your words on tongue. Fantastic post Elmo. . . But has there ever been a non-fantastic post? And I can detect a hint of your residual garlic "cologne" up here in the Bay Area, and I'm not sure whether it is real or imagined! I must go in search of this more potent garlic paste! I'm so used to the one at Zankou's, that it just tastes like butter to me. And I can still smell it on myself like the last fragments of a dream just before you wake up. Falafel! It had been on my mind for weeks. I'd been hunting for a good falafel for weeks. With none to find in Irvine/Tustin, I went to the only area I knew would have it. And thanks! I didn't realize this review was long until I finished. I guess that means it was easy to write. Thank you! I always appreciate your kind, kind compliments. Eau de Garlique has finally subsided (after a good one and a half days), but I can't wait to stink myself up again. I'll just have make sure I'm not going to be doing any close-up talking with co-workers or customers. Be careful what you wish for! ;-) This stuff is lethal. Lethally good! Are you talking about the awful falafel at Caspian? Ugh! I think it's terribly overpriced and not tasty at all. How can falafel be any good if they're baked squares? I am notorious for suggesting "better" places from the places you review. This time,I have nothing to say except "what a great find" and this place seems really unique and good and I will have to try it!" Great job and I have no better alternative! Yum! I grew up on that kind of food. Odd for a white girl, huh? And I love me some garlic! If you ever have a chance to try the baba ghanouj there, I do hope you'll let us know how it is. I love baba ghanouj! Especially when it's really lemony, garlicy, and has big chunks of eggplant! Do you have a kind of internal sushi restaurant ranking? I'm trying to figure out where to eat next week.. maybe Shibucho one night and somewhere cheaper at lunch. o.k., not far from my office...I've got to hit this place! Falafel as baked squares! That is wrong on so many levels. Actually I was talking about the soggy, flavorless mess that they have the nerve to call falafel at this stall in a food court on Barranca and Von Karman. It was like eating a damp, sawdust pita. "Blistering"...man I wished I used that word. That was exactly what it felt like. Believe me, I can't wait to try Carnitas Los Reyes. But things have been hectic for me this past week. You'll see a review soon, I promise. Me want menudo. It was so right, it was almost wrong. Like chomping on a raw clove of garlic like it was gum. You have the most eclectic taste of anyone (white or otherwise) I know. And kudos to you. You know I've never even tried baba ghanouj. I think I might have actually, in my pre-foodie days, and didn't know that it was baba ghanouj. Actually, I would put Sushi Shibucho and Bluefin (Newport Beach) at the top of my list as a tie. Although, you really have to sit in front of Shibutani himself (the son's good, but not like his dad). Best thing is to sit at the table if you can't sit in front of the old man. This way, both will prepare some of your pieces. Bluefin's sushi isn't as good as Shibucho, but the cooked dishes are just plain awesome. Japanese with a French/California influence, not the other way around. Somewhere in the midprice range (cheaper), I like Sushi 5 in Tustin. It's a revolving sushi place, but some pieces are divine. Most, if not all, will be prepared to order. My standby, in my own neighborhood, is Maki-Zushi. They've gotten really consistent lately. Hitting their stride. Owned by Koreans, but the head sushi chef is Japanese. The guy who makes the rolls is still kind of green, so the thing to get is the nigiri. Right now, they have three tuna nigiris on special. Two fat pieces are $2.00. Be sure to allow plenty of time if you try it out. It's a two-person operation, and they are ALWAYS slow on production. Nothing hits the grill or fry pan until someone orders. Dont want you to be disappointed. Awesome review, elmo. I love falafel and Middle Eastern food in general. I really hope I get a chance to try this place the next time I am in SoCal. Thanks for the clarifications. Man, so many restaurants to try, so little time! As always, thanks for your encouragement. Comments like yours makes me want to keep going. I went to Sahara Falafel this past Saturday based upon your recommendation from Chowhound. I had been craving falafel for some time but just didn't know where to go for really top notch falafel that would really satisfy. Sahara Falafel totally blew me away. I knew I was in for a treat when I saw the older lady in the kitchen dropping the falafel mix into the hot wok full of oil. When the food came to our table I immediately bit into the otherwise standard-looking falafel. The delicate dark brown crust shattered in my mouth and gave way to the freshest, fluffiest, smoothest falafel I have ever tasted. Thank you so much for this great rec! p.s. I have been a big fan of your blog and posts for a while! Thanks for reporting back. I haven't found better falafels than these...it's so spot-on awesome that nothing else I've had since compares. Still I hope that someday some falafel maker rises to the challenge! I'm glad you enjoyed them! After reading so much about Sahara, I finally went there today for lunch. I was a little puzzled upon my arrival at 12 noon on a fine Saturday to find the place empty of customers! There's a nice young girl working there now, name of Sandy. When I introduced myself by saying this was my first time there, she gave me a sample (1/2) falafel ball - cool. I ordered the Falafel sandwich ($4.99 - can we quote prices?) and told her I heard about Sahara online - through this and other blogs. Apparently she wasn't aware, so I gave her the title Monster Munching. When the sandwich arrived, it was wrapped tightly in foil...I began unwrapping it, but Sandy stopped me and demonstrated the best way to eat the messy concoction: just hold it upwright vertically and tear off a bit of foil at a time as you eat. Eventually, it still leaked tahini sauce, each drop of which I eagerly scooped up with my finger, heh heh. I ate fairly slowly, and around 1 PM business picked up as a lot of smiling couples and families arrived for lunch. One interesting fellow that I kept staring at looked like he had just time-warped out of a disco circa 1977: old gent with a jet black combover/mullet and giant sideburns wearing a bell-bottomed grey double-breasted suit and, to top off the look, huge rose-colored aviator sunglasses! Ahahahaha! Anyway, since I had never had falafel before (but LOOOOOVE hummus) to be honest I was a little underwhelmed with the taste. But, it's definitely high quality, served hot, and quite filling. I will go back and try the chicken shawerma! Owner's name is Mahmoud Salem, he's the older fella with extremely hairy arms. Tell him, "Merhaba". He's been running Sahara since 1995. The place is a bit stuffy: like the infamous 1.99 Restaurant the doors are left open early on, so expact flies to come on in and check out the scene (also like at 1.99). Sahara is a bit hard to find; it is on the northeast corner of Brookhurst & Orange Ave between a 7-11 and a check cashing place. The sandwiches are mostly $5.99, the plates range from $9 - $15. Well, sorry to write a novel, maybe I should do a blog too, ha ha. Pay close attension to the check. They (cashier / manager) cheats people who dont pay close attension on the numbers. They dont provide a check, charge tax but have not record keeping. I wonder where the IRS is ??????. to When inquired once about an extra charges he blamed it on extra bread given. bn afteut the numbers did not match even after adding them with tax. yummy food!!! BEST i have ever been to and VERY HEALTHY!